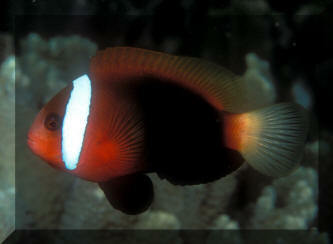 Amphiprion melanopus Bleeker 1852, the Red and Black Anemonefish, Melanopus Clown. 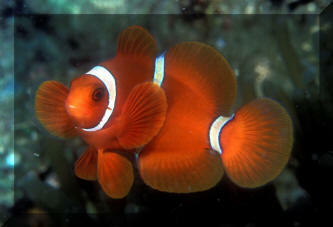 Variable amounts of red and black, with or w/o a "Tomato Clown" like single white head bar. Indonesia, to the Society and Marshall Islands. To nearly five inches in length. Most often found with Entacmaea quadricolor as anemone symbiont. Here in N. Sulawesi. 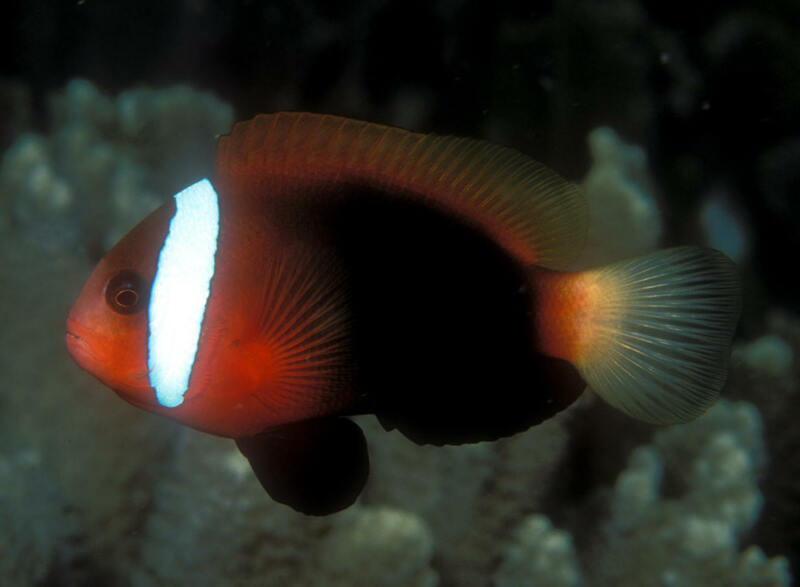 Amphiprion nigripes Regan 1908, the Maldives Anemonefish. Western Indian Ocean; found only about the Maldives and Sri Lanka. Females to four inches, males half that. This aquarium photo shows better than my Maldivian ones the species distinctive dark underbelly. 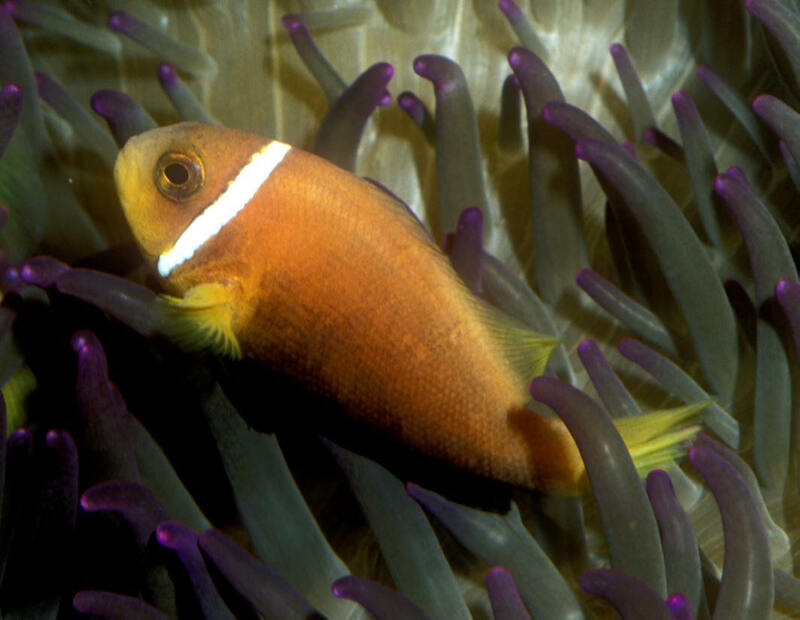 Premnas biaculeatus (Bloch 1790), the Spine-Cheek Anemonefish, Maroon Clownfish. 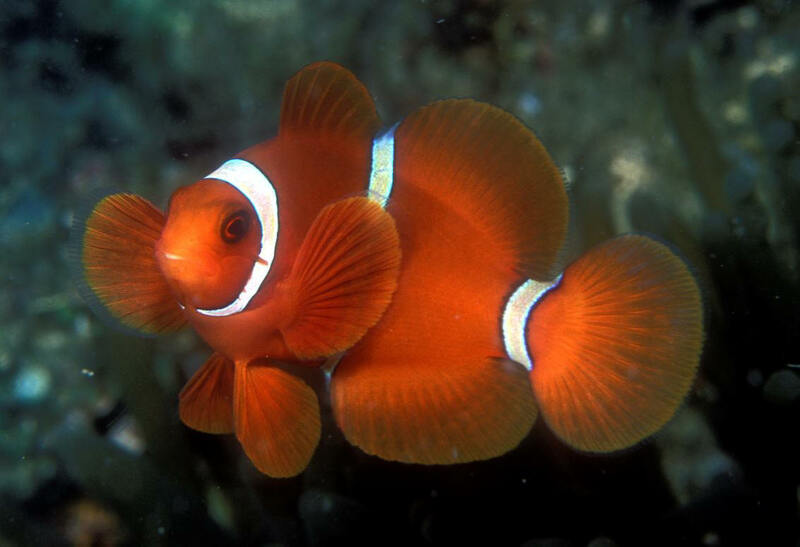 Bright red to orange body and fins, with three narrow white body bars and prominent opercular spine. Females to six inches, males about half that size. A male in KBR, N. Sulawesi, Indo. Premnas biaculeatus (Bloch 1790), the Spine-Cheek Anemonefish, Maroon Clownfish. Bright red to orange body and fins, with three narrow white body bars and prominent opercular spine. Females to six inches, males about half that size. A male in Wakatobi, S. Sulawesi, Indo.